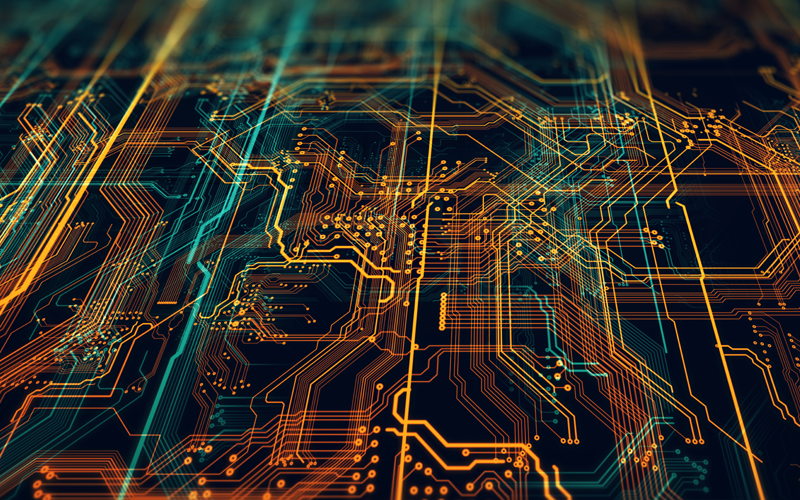 From healthcare to manufacturing to consumer goods, the adoption of artificial intelligence and machine learning is quickly becoming indispensable to how we live our lives. Both were the focus of the Rethinc. Machine Learning Symposium on Friday, Nov. 29, at the Kenan Center in Chapel Hill. 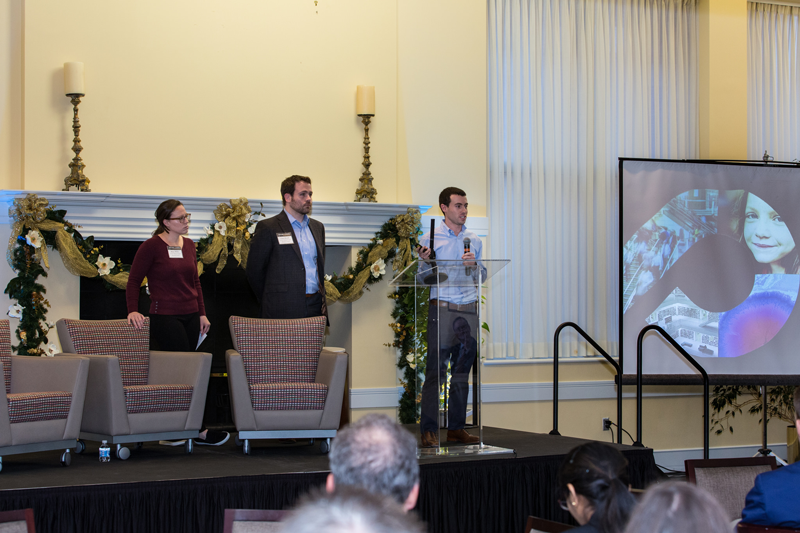 The event, a joint effort of the Frank Hawkins Kenan Institute of Private Enterprise and Infinia ML, brought together more than 100 academic, policy and business leaders to connect cutting-edge ML research with practical business implementation. Kenan Institute Executive Director Greg Brown opened the Rethinc. Machine Learning Symposium on Nov. 30 by introducing the institute’s newest initiative Rethinc. Labs. Attendees got to see first-hand how cutting-edge ML research can be paired with practical business implementation. 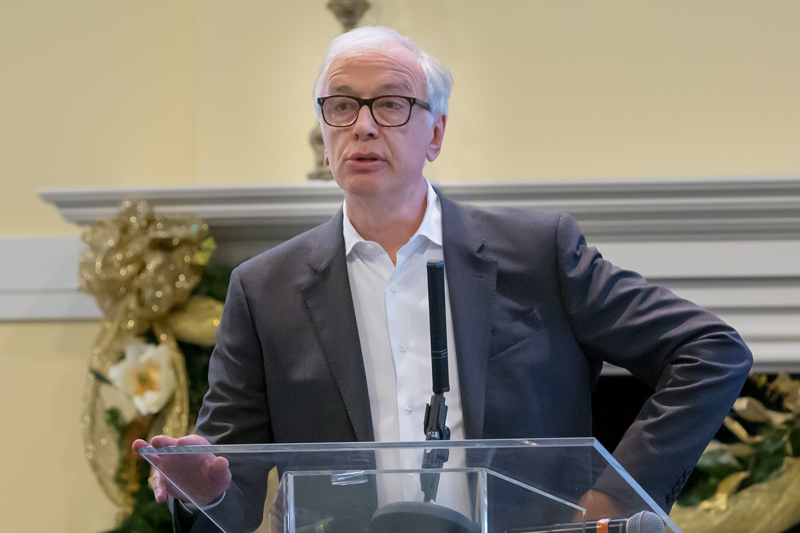 Eric Ghysels, Edward Bernstein Distinguished Professor of Economics and adjunct professor of finance at UNC Kenan-Flagler Business School, shared his work on “Artificial Intelligence Alter Egos.” Ghysels has been an essential partner in the Kenan Institute’s Rethinc. Lab initiative. 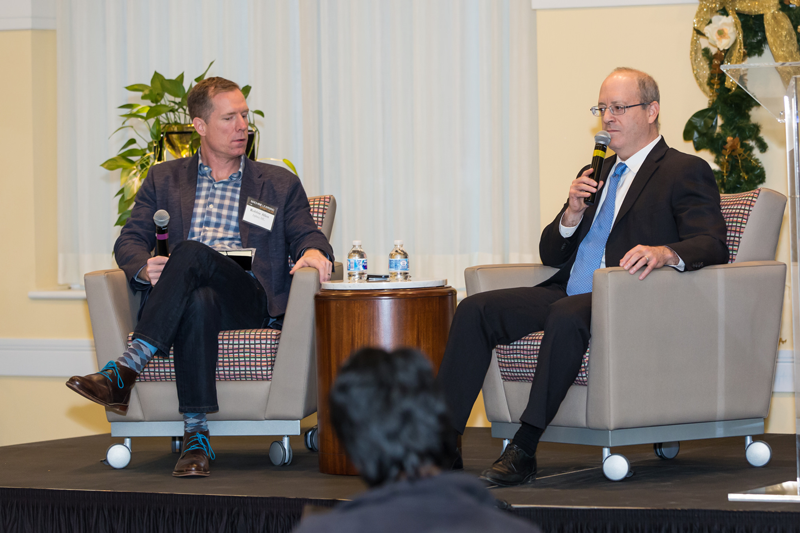 Infinia ML CEO Robbie Allen interviewed Infinia ML Chief Scientist Larry Carin on “Machine Learning’s Near and Distant Horizons” to close the symposium. More than 100 representatives from academia and the private sector attended the Rethinc. Machine Learning Symposium in Chapel Hill. The day began with introductory remarks by Kenan Institute Executive Director Greg Brown and Robbie Allen, CEO of Infinia ML. Speaking of the two organizations’ partnership, Brown described the symposium as “the top of the first inning” of a larger effort called Rethinc. Labs. He said, “It’s not going to be a traditional academic center…we’re thinking of this more as a skunkworks type of operation,” with a focus on the strategic implementation of ML based on real-world business needs. Allen discussed the genesis of Infinia ML, which was spun off from a machine learning lab at Duke University 14 months ago. 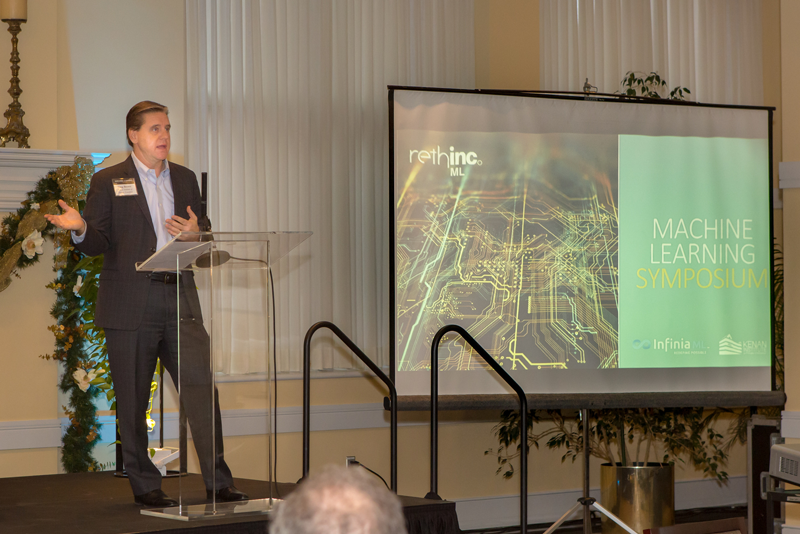 Citing the promise of ML for business, Allen said, “The expectations for ML are high, but the technology to integrate ML into businesses is still relatively immature,” providing an opportunity for companies like Infinia ML and investigative efforts like Rethinc. Labs. 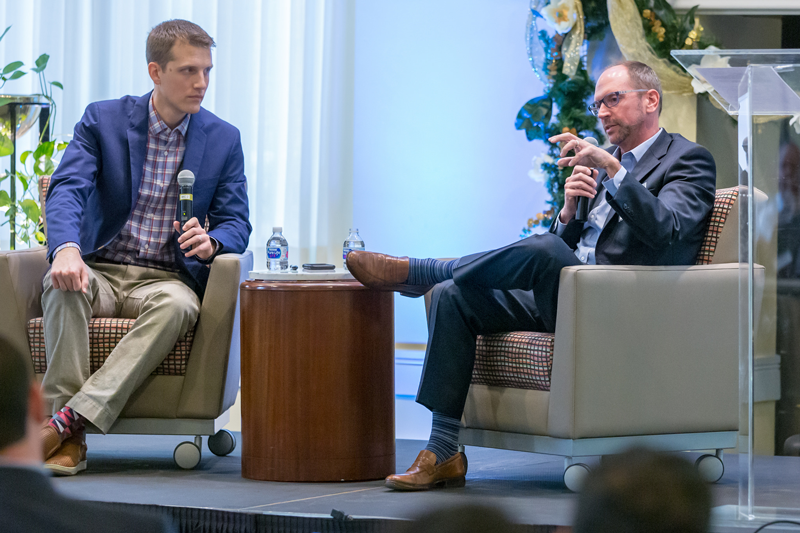 Infinia ML Marketing and Communications Director James Kotecki sat down with RTI International Executive Vice President and Chief Financial Officer Michael Kaelin to discuss machine learning in the enterprise.“The essence of the organization [RTI International] is very entrepreneurial… our question is always ‘how can we continue to innovate?’” Kaelin told attendees. He emphasized how the company is incorporating ML into its daily operations and long term decision making. 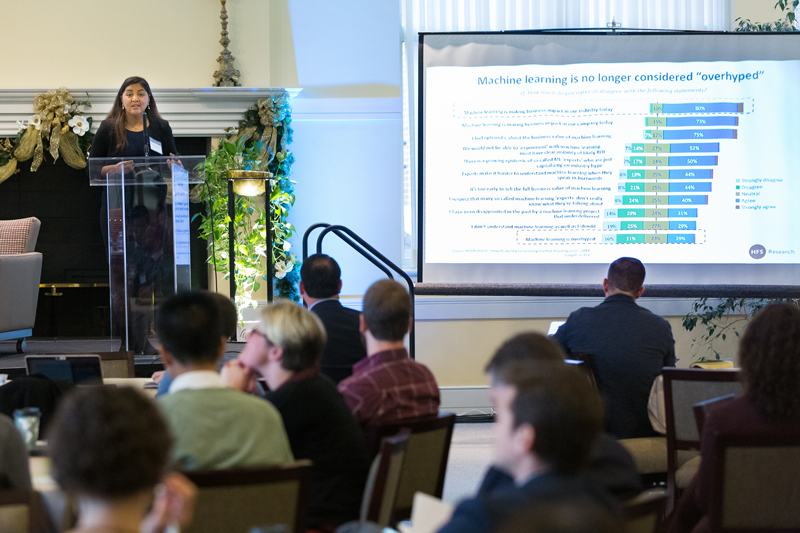 The symposium covered a broad spectrum of ML-related innovations, including improved capabilities to understand spoken language, capturing user interactions to develop more relevant algorithms, teaching AI agents to accurately understand and express human emotion and robo-advising for asset and wealth management. This last innovation is disrupting the banking sector in a major way, said Eric Ghysels, Edward Bernstein Distinguished Professor of Economics and adjunct professor of finance at UNC Kenan-Flagler Business School. But banking isn’t the only field in which ML is shaking up the status quo. Nearly every industry has been impacted. 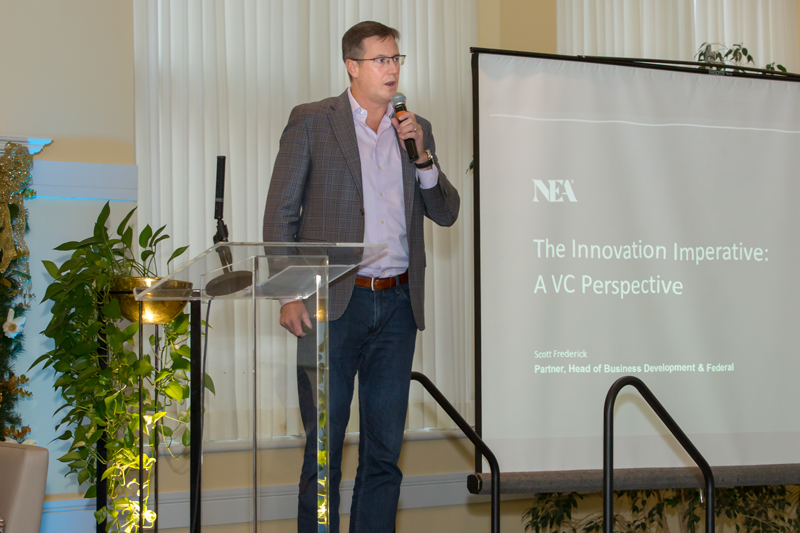 Keynote presenter Scott Frederick, partner and head of Business Development and Federal for NEA, one of the largest venture companies in the world, presented statistics on the average lifespan of an S&P 500 company – down from 67 years in the 1920s to a mere 15 years today. To survive, said Frederick, incumbent companies need to innovate. But companies are frequently blinded by assumptions about their market, product and customers. In the worst case scenario, they may not even realize that the playing field has changed. According to Frederick, ML is an innovation that companies need to adopt not just to thrive, but to survive the competitive marketplace. But while ML may be more approachable than many think, for success, it also requires that businesses understand both their data and processes. 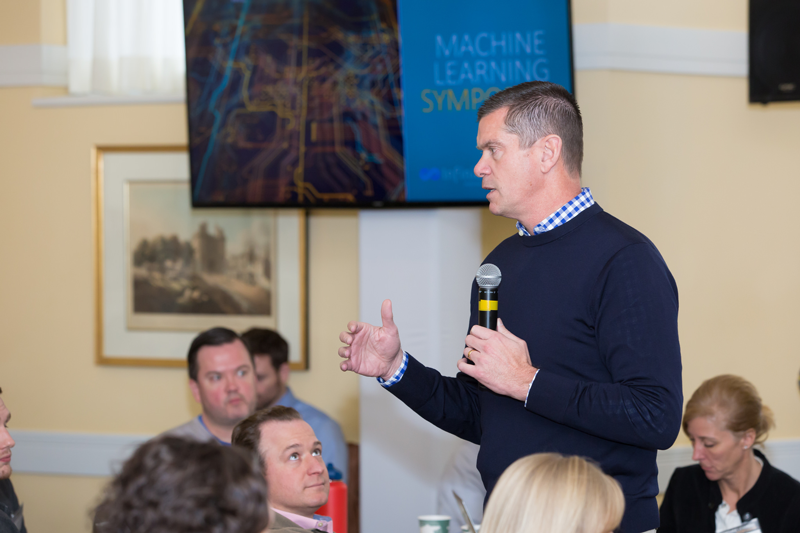 Brett Wujek, principal data scientist in the Artificial Intelligence and Machine Learning Division at SAS emphasized that businesses need to have the right data for ML to work with any degree of accuracy. And Ya Xue, director of Data Science Operations at Infinia ML, described the types of business processes that best lend themselves to ML – namely, well-defined, repetitive processes without a high performance requirement. 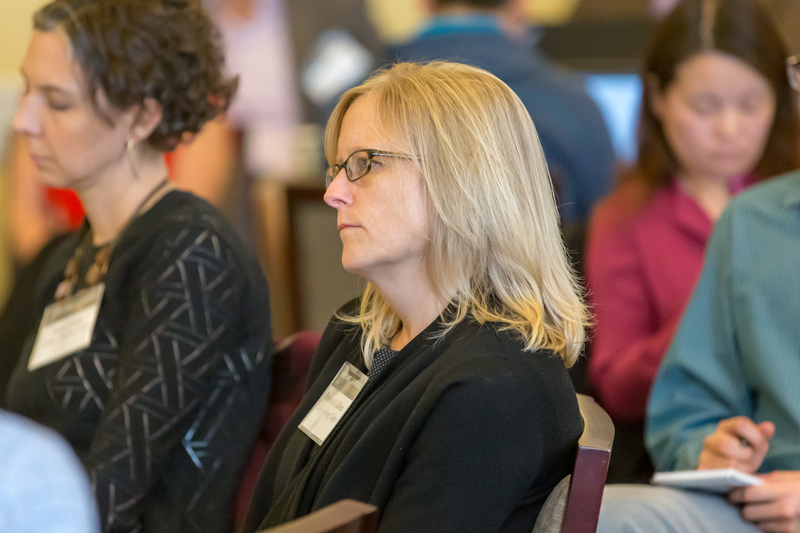 The symposium ended with a reception, giving like-minded attendees ample time to further discuss the concepts and innovations they had explored together throughout day. For more information on upcoming Kenan Institute events, click here. To learn more about the Rehtinc. ML initiative, check out the website.